Here you can find links to organisations who have commissioned Desmond's work and have it on display. The Irish Rugby Football Union commissioned Desmond to execute a series of Drawings to record the famous stands, clubhouses, terraces and grounds in Lansdowne Road, Dublin before they were demolished. The new stadium re-opened in 2010. University College Dublin commissioned Desmond to create a series of fine art drawings of its Merville House facility in 2003. 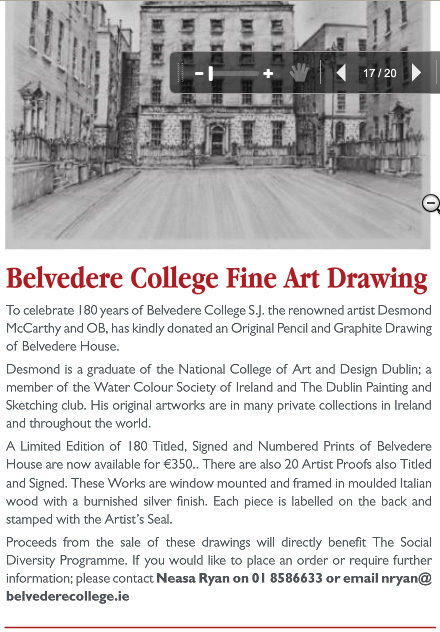 Belvedere College commissioned Desmond to execute an original drawing of Belvedere House, in Great Denmark Street, Dublin.